While love and business are rarely used in the same sentence and giving hugs is not a practice typically endorsed by most HR managers, without a doubt love is the greatest performance, productivity, and loyalty builder there will ever be. The number one concern, whether it's conscious or subconscious, of employees and customers is "Do you care about me?" "Do you care about my future, my life, my career, my well-being?" When you care about your employees and co-workers they will work longer and harder to support your efforts. When you love your customers and look out for their best interests they will feel that love and love you back in the form of more business, customer loyalty, and referrals. When you don't treat people like a number they won't treat you like a number. This is why I recommend that you become a Love Magnet. The more love you put out there the more love comes back to you in the form of greater success, more happiness increased wealth, more customers and more joy. You don't become a love magnet by wearing expensive cologne and perfume or by giving inappropriate hugs. Rather, you become a love magnet by loving your co-workers, your family, your friends, your customers and those "passengers" who may get on "your bus" as you journey through life. Here are five ways to become a Love Magnet, adapted from The Energy Bus: 10 Rules to Fuel Your Life, Work, and Team with Positive Energy. If you haven't read the book yet, I encourage you to read it and let it inspire you to take action as it has done for others around the world. 1. Tap the Power of Now - In our technology filled world, that zaps our time and energy, it seems we are making less time for people and our interactions are less meaningful. When you are with a customer, employee, co-worker, etc. be engaged in the present moment. Energy is most powerful when it is focused on the here and now. Try not to think about the 5 things you still have to do that day or the 5 other people you need to meet with. Really be present with that person and focus your energy on them. They will feel the difference. 2. Listen to People - One of the most important factors that determines a high management approval rating is whether the manager listens to the employee. Does the manager hear what the employee has to say? Does the manager listen to the ideas and needs of the employee? Your employees and customers just want to be heard, so listen to them and hear them. Also do this with your friends and kids. It works wonders and shows others how much you care. 3. Recognize People for their Accomplishments - Make it real and personal. Send your employees and co-workers a personal birthday card with a handwritten note, not some electronic fake signature but a real note that shows you took the time. Make it a point to acknowledge your colleagues every time they do something right. Write notes, make calls, make a personal visit and give them a pat on the back. Send a note of congratulations when you hear a customer, colleague or family member enjoyed some kind of success. Of course do this with your kids too. Praise their efforts. 4. Serve Them - Rich Melman, Chairman of Lettuce Entertain You once said to me "The higher you get in an organization the more it is your duty to serve the people below you rather than having the people below serve you." The key is to serve their growth, their future, their career, and their spirits so they enjoy work, life, and being on your bus. When you love others, you serve them and help them grow into their full potential. Love is demonstrated through service. 5. Bring out the Best in Them - The best leaders and managers bring out the best in others. They help people discover and utilize their strengths. When you love someone you empower them to be their best. When people are sharing their strengths everyone benefits. 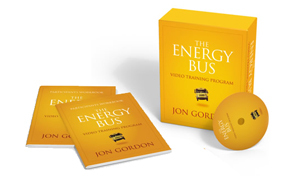 Now you can get your team on the bus with Jon Gordon as he shares insightful stories, best practices and 10 powerful principles from his best-selling book, The Energy Bus via video. Whether you are a leader looking to build a positive culture, a manager trying to energize and engage your team, or someone who desires to enhance your performance and productivity this video training program will help you implement a proven model for success that has been successfully adopted by thousands of organizations worldwide. This program includes a 45-minute video training in which Jon Gordon shares stories, real world examples and the 10 Rules to Fuel your Life, Work and Team.